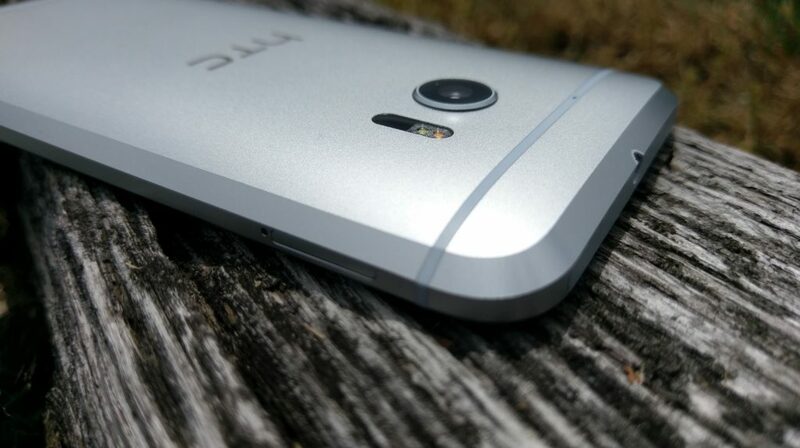 Launched in spring of 2016, the HTC 10 is, at first blush, a simple evolution of the One series introduced a few years back. But, spend some time with the device and you’ll see that it’s not just another trip to the well for HTC. Indeed, this one sprinkles in a bit of revolution, too. The HTC 10 is a surprisingly strong contender for phone of the year. The target demographic for the HTC 10 is a consumer looking for a powerful experience that offers up some of the latest and greatest in hardware. The specifications for the phone put it right in line with top models such as the Samsung Galaxy S7, LG G5, and Apple’s iPhone 6. If you’re the type who buys based on bullet points and fact tags, the HTC 10 should quickly rise to the top of the heap. In short, the HTC 10 is flagship through and through. Let’s be honest here. It’s getting harder and harder to create a smartphone that physically stands out or doesn’t resemble every other handset on the market. For some companies that’s not really a problem and coming to market with a lookalike or slight variation on last year’s phone is okay. It seems to work for Apple and Samsung has been guilty of it for a few generations. The 2016 crop of devices is somewhat different so far in that LG has shaken things up in the G5 and it’s not as similar to the G4 as it could have been. The Galaxy S7, for its part, is a departure from the Galaxy S6. As for HTC, this year’s model looks similar enough to the previous generations that you won’t mistake it for another brand. A few minutes of holding it, though, tells you things are different here, too. I was pleased to see that the HTC 10 carries over some of the design language of its predecessors. There was nothing wrong with the M7, M8, and M9; they were just a little too close to each other. 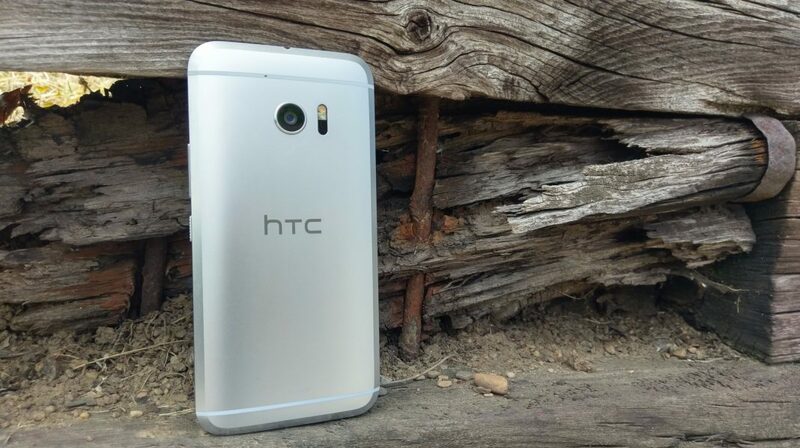 The HTC 10 brings forth a combination of that line as well as elements introduced in the One A9 last year. The HTC 10 looks, and feels, like a premium phone. Thanks to a unibody aluminum chassis with chamfered edges, the handset is weighty and durable and has the air of a well thought out design. The brushed finish is a nice touch and plays nicely with any color variation. Pick the phone up and you immediately know that HTC isn’t messing around. 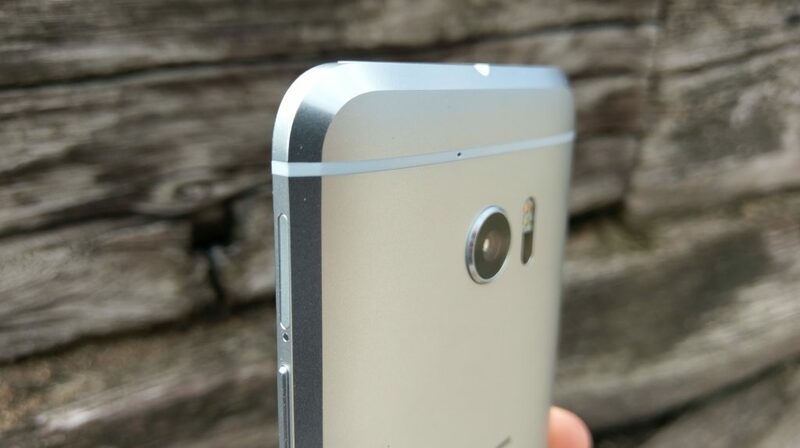 Like the One M models before it, this phone has a tapered design to the rear. It’s comfortable to hold in hand; the pronounced chamfered edges call for attention but also make for an easy grip around the edges. Tossing this into a pocket is fantastic as it simply slides along the curves. A word of caution, though, as it can feel slippery at times. One of the things I like to do with every new phone is grab it from the ends and sort of twist or apply pressure. It’s here where you’ll sometimes figure out which phone is cheaply built. The HTC 10 did not creak or move, even under moderate pressure. Again, it’s kind of hard to reinvent yourself each year and there’s only so many ways to design a smartphone before it feels awkward. The HTC 10 doesn’t do anything strange with its button configuration or SIM card placement. Looking straight on, the right side features the volume rocker about 3/4ths of the way up. Below that is the power button. 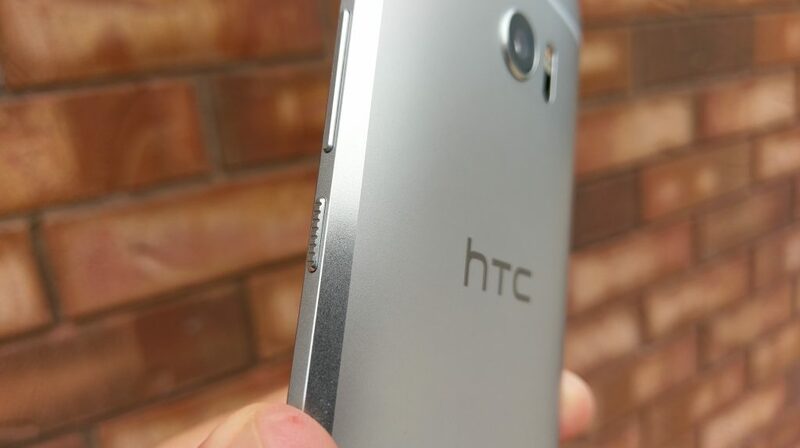 As is the case with the One A9, the HTC 10’s power button has a textured feel to it. This makes it very easy to feel in the dark as there’s no mistaking it for the volume controls. All three buttons are responsive and let the user know for certain that they’re being pressed. On the left side of the phone is where you’ll find the memory card and SIM card tray. Located near the top, it pops out to allow for access. Those of you who have a microSD card will be happy to know the HTC 10 supports up to 2 terabytes of external storage. Down below the display you’ll locate the lone fingerprint reader which doubles as the home button. HTC has opted for capacitive buttons for this year’s model; the “back” is found on the left side while the “multitask” button is on the right. 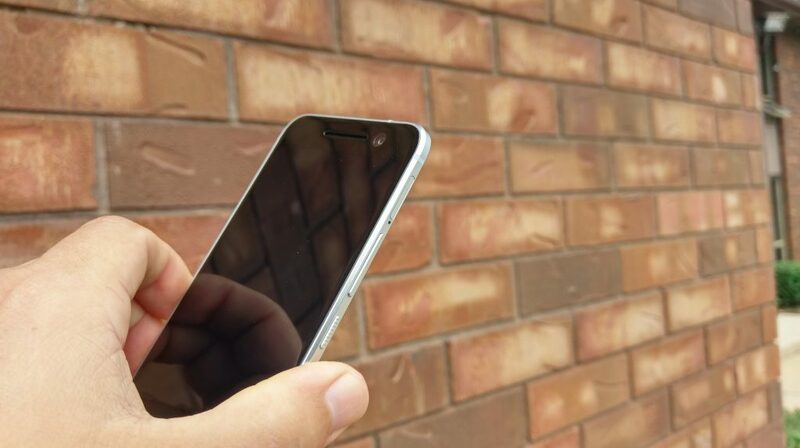 The fingerprint sensor is fast, accurate, and works well even if your fingers or the phone is slightly damp. It’s a little cramped down here as the button is ever so closer to the edge of the phone than the display. At the very top of the front panel is a speaker grille and front-facing camera. There’s no dual-speaker setup this time around. The top is for the BoomSound tweeter while the other speaker is located below the phone next to the charging port. 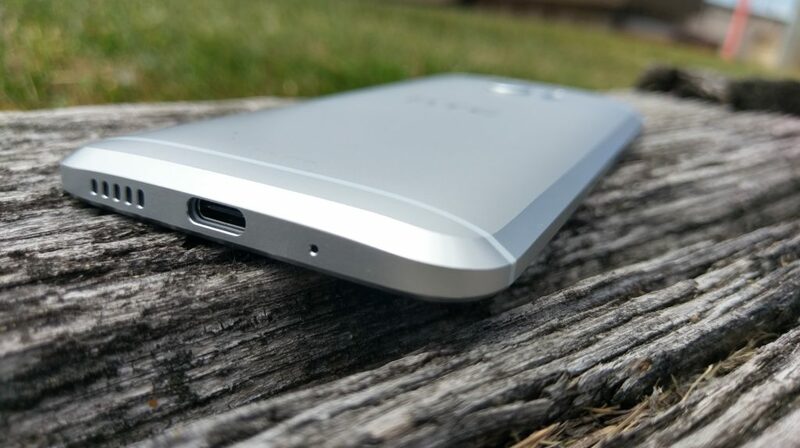 We appreciate that HTC integrated a USB Type-C charging port for this model as it’s quickly becoming a standard. Moreover, the Quick Charge 3.0 support lets us plug in for fast recharges. Around back we locate the rear camera with flash and antenna lines. The camera module does jut out from the phone a bit but the sapphire glass keeps things from getting scuffed. Getting back to the unibody design, the rear stays put. You’ll not be able to remove anything here, particularly a battery. At 5.2-inches, the HTC 10 is a great size for most smartphone users. Sure, we do get spoiled by those models that tread into the 5.5-inch and 5.7-inch space, but those phones are often unwieldy or hard to use with one hand. The 2,560 x 1,440 pixel display is gorgeous and puts HTC back in the conversation of high-resolution screens for a flagship phone. The Super LCD 3 panel is fantastic, represents colors very well, and can be pushed to a really bright image. Indoor, outdoor, it doesn’t really matter where you use it. Taking pictures in broad daylight is no challenge. Thanks to an oleophobic coating, the screen is built to withstand scuffs and scratches. The model we reviewed was an unlocked variant which supports AT&T and T-Mobile here in the US. We used a T-Mobile SIM for the duration of our testing and found it connected about as good as other phones we’ve used in the same areas. There are spots where we’d see it display fewer bars on the screen than normal, but calls worked well nonetheless. Unfortunately, there are pockets where T-Mobile doesn’t pick up near the house so we had to rely on WiFi for calls. It seemed we had to use Wi-Fi a little more than other phones as of late but that could also be attributed to more trees and foliage at this time of year. Placing a call on speaker phone was a pleasure with sound filling rooms clearly. Inside of an office is one thing, but even outside, with ambient noise and random traffic, worked well. Whereas BoomSound stereo speakers typically shared the load equally between them, the HTC 10 is different. The top speaker provides the highs while the one below the phone gives the lows. If you’re holding the phone in portrait mode, you may find yourself somewhat covering the speaker. Place the phone on a table for music or for watching YouTube videos and you’ll find a loud sound. Playback is clear and crisp and it gets very loud. Speaking of which, you’ll want to keep that in mind when setting alarms. You surely don’t want to wake up to this phone at top levels. 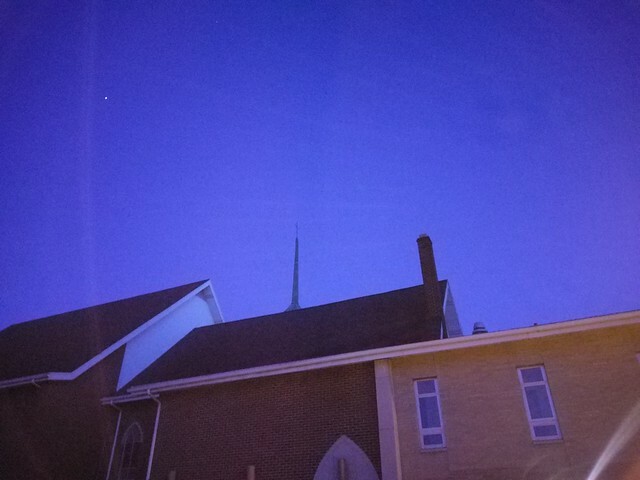 We did find that holding a phone in landscape mode for video can also create a somewhat wonky listening experience. Given we naturally want to hold the edges of our phone, it’s pretty easy to cover half of the sound. Along those lines, it’s sometimes strange to watch longer videos with sound not balancing equally. 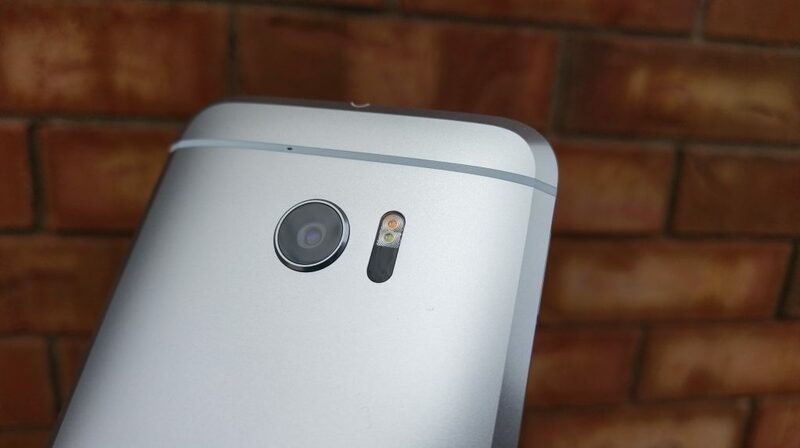 After taking a year off with the M9, HTC is back to using its “UltraPixel” camera for pictures. As some of you know, the number of pixels doesn’t necessarily equate to picture quality. To that end, don’t let the 12-megapixel sensor in the HTC 10 fool you into thinking it’s lesser quality than some other brands and their 16-megapixel, or higher, shooters. The ultra aspect means larger pixels with more light and improved low-light images. The HTC 10 camera features optical image stabilization and a f/1.8 aperture. What does this mean to you? It means incredible pictures in a whole host of light settings. We found the HTC 10 camera to be among the absolute best smartphone shooters we’ve ever tested. Time and again we were impressed with the shutter speed, focus, and colors. There are few things that we enjoy more about a handset’s camera than being able to set it on automatic and trust things would work. That’s exactly what we found with the camera in the HTC 10. Very rarely did we move over to Pro (manual) mode to mess with some of the settings. And, even when we did, the options were clearly presented on the screen and the dials were intuitive. Don’t know what ISO or WB settings are as it pertains to your end result? Play with it a bit and watch how it impacts your picture. If you’ve used an HTC phone from before, you’ll know that the camera app can be a tad overwhelming. That’s not the case this time around as HTC has trimmed the shooting modes down, rejiggered the layout, and generally simplified the experience. Hopping to and from video is quick; switching to manual mode, panoramic, or Zoe is also in the same place. We especially liked the convenience of toggling on and off the HDR. The laser-assisted focus is lightning fast and we found ourselves capturing the exact moments we wanted. You know that issue with phones where you have to snap the camera a hair sooner than what you really need? That’s not the case here. The HTC 10 grabs the photo you want the moment you take it – even with HDR on. If we could be picky for a moment, the notifications that pop up for the laser focus can be a tad aggressive. Simply putting your finger up near the lens results in a notification. We get it – we shouldn’t cover it up. Please stop telling us. Recording video is just as pleasurable; the phone allows for up to 4K capture. We’d recommend sticking to 1080p for your video unless you really wanna show off. Seeing as how not too many of us own 4K televisions yet we don’t see the need for the video. Also, if that’s what you want to do with your phone, make sure you’ve got a sizable external memory source because 4K files are huge. At 3,000mAh, the battery is not quite as capacious as it would have been one year ago. We’re now expecting our flagship phones to have this much juice, especially if it’s an internal, non-removable unit. HTC claims the battery can give users up to two days of normal usage. In our testing, we deduced that for most people, this is more than enough capacity to get them through a full day’s use with extra to spare. A more aggressive person who likes to game, or enjoys videos on a regular basis… maybe a day. As mentioned above, the phone employs support for Quick Charge 3.0. This means you’re going to charge up super quick. We’re talking almost to the point where you’re looking at your phone and watching it tick up. Get about halfway through your day and need to ensure the phone’s going to stay up late with you? Throw it on a charger for a half hour and you’re all set. A typical commute home from work is likely all you need to top off your phone with enough battery to see you through a long night. You can squeeze more life out of your battery by enabling the Power Saver mode or Ultra Power Saver mode. Each can slow down CPU cycles, reduce screen brightness, adjust vibration settings, and more. One just happens to be way more aggressive than the other. Suffice it to say, we didn’t have to use the Ultra aspect once in the few weeks we’ve tested this device. Running Android 6.0 Marshmallow, the HTC 10 employs a custom launcher known as Sense UI. Around for the better part of a decade now, it is the handset maker’s way of delivering a user experience that it thinks is right for consumers. In the past it was knocked for being too heavy or bloated. As time went by it didn’t evolve much and became outdated feeling. The idea was right but the execution was not. This is not the case any longer. The Sense UI is much lighter than it was in the past and doesn’t come across as some branded agenda. You’ll find there’s still traces of customization and HTC-infused features, but nothing you’ll dread. If you’ve ever used an HTC Android phone in the past, we invite you to revisit the Sense experience. For those who have not, we venture to guess you’ll be hard-pressed to discern where stock Android ends and where HTC’s tweaks begin. Users will have a variety of lock screen behaviors and settings to choose from, each with a slightly different setup. It’s possible to tailor how much information is present on the lock screen, keeping your important details hidden away if that’s your thing. Also present with the lock screen is the shortcut icons to launch quickly into various functions of the phone. As mentioned before, there’s a fingerprint scanner with the phone so there’s that extra layer of security, too. We trained the sensor to recognize multiple fingerprints; the phone is very quick to recognize the presses. It didn’t take long for us to prefer the fingerprint for unlocking the device. The first time you load up the phone you’ll find two home screens, one of which is the BlinkFeed (social news aggregator). It’s quite easy to start customizing and tweaking the look and feel as HTC puts options in easy-to-discover places. Want to change the fonts, icons, and widgets? That’s no sweat with HTC’s software. Actually, that leads into the next aspect of the software experience: themes. Like other recent models from the company, the HTC 10 lets users shop for custom themes. And, rather than sticking to your standard rows and columns, the Freestyle themes let you place stuff exactly where you want, without adhering to grids. The selection of themes has continually improved and there’s something for everyone. Minimal, futuristic, cartoon, professional, or another design, you’ll find a look you love. There’s a new Boost+ app that comes loaded HTC which is designed to keep the phone running smoothly. 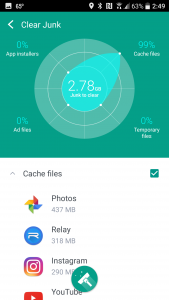 With the app you’ll be able to perform quick checks on performance, free up RAM and storage, and uninstall unused apps. Additionally, Boost+ lets HTC 10 owners lock individual apps to where they’re only unlocked via a password or fingerprint. Let’s just cut to the chase; the HTC 10 is going to handle anything you ask it to do. Not only that, but it’s gonna do it quickly and without hiccups. This is exactly what you’d expect when you pair 4GB RAM with the latest Qualcomm processor, the Snapdragon 820. As a daily driver for typical users, the HTC 10 doesn’t even come close to tapping into its potential. Gamers and those who like to push their tech will be pleased with the performance of the handset. Whether it’s a first-person shooter, racing game, or something else with flashy graphics, the phone chews it right up. One reason the HTC 10 might do so well is that it isn’t full of bloatware that runs in the background. Although we tested an unlocked model with nary a carrier app or service, HTC says the network-branded versions are light on clutter. The less there is sipping at the resources, the better. Oh, and let’s not discount the way Android 6.0 Marshmallow handles processes. All of these things provide a perfect storm, of sorts. It’s very easy for us to recommend the HTC 10 for your flagship smartphone needs. It’s the perfect balance of performance and beauty; the handset is everything we want. The metal design, chamfered edges, and brushed finish offer up one of the most physically appealing models available today. It’s somewhat ironic, then, that this phone is mostly an evolution of the previous One M line. There’s just enough different here to bring old M8 and M9 users back. In previous years, HTC was applauded for build quality when other companies were going the cheaper, polycarbonate route. Now that other brands seem to have caught on to using premium materials HTC’s effort might be construed as simply keeping pace. Is that the case? Perhaps. Does it stand out that much over some of the other flagships of the day in terms of build quality? Maybe. It’s a solid phone either way and there’s no denying HTC cared about the overall product. It’s certainly no less quality than any other phone. We’re really impressed with the way HTC has managed to dial down the Sense UI yet still retain the custom experience. Although we love and prefer stock Android, HTC Sense UI is nowhere near as obnoxious or outdated as it was one or two generations ago. In fact, we’re kinda digging the stuff that’s present. 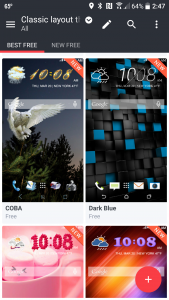 Moreover, we’re not in a hurry to install a custom launcher now that the themes are where they are today. Sure, we’ve come to love and expect the uniform approach of something like Nova Launcher, but we’re not everyone. The customization that comes with HTC’s themes are well-rounded and feature unique flavors to breathe new life into the UI. Best of all, however, is the simplicity in which they can be installed. In terms of performance, it’s going to be hard to top the Snapdragon 820 processor and 4GB RAM. As of right now you can’t. There’s so much to love about the HTC 10 and its ability to handle tasks and games. Time and again we were throwing as much as we could at the phone and it never stuttered. If you’re in the market for something powerful and finely crafted, the HTC 10 should be on your short list. Not everybody wants or needs to spend $500+ for a phone, but for those who do, this one certainly deserves your attention. Easily the best we've ever seen from HTC, this one is also in the running for the top handset of 2016. Although it looks similar to previous One M models, there's enough difference to make it stand out from its past. It is time to reconsider HTC as a preeminent player in the space.